Dianne Martin, the vice provost for faculty affairs, will retire this August after almost 33 years at GW. Martin helped to create more than 170 full-time, tenure-track faculty positions since 2008. Faculty said they will lose a connection to the administration after GW’s top faculty official leaves. 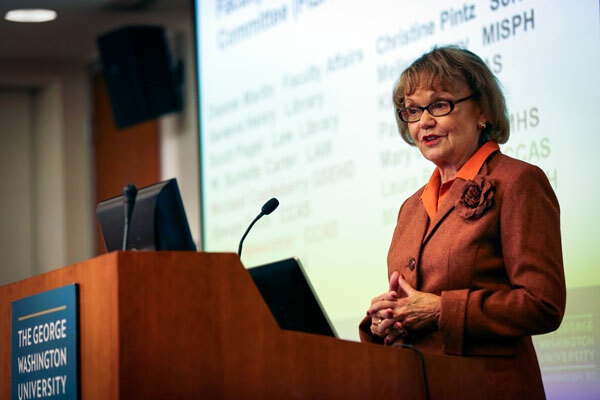 Dianne Martin, the vice provost for faculty affairs, who will retire in August, oversaw some of GW’s biggest projects while working closely with faculty members from across the University. Faculty said they are losing a strong voice among administrators that always prioritized their concerns. Martin, who came to GW in 1983 as a computer science professor, was the chair of the computer science department, the director of the Cyber Security Policy and Research Institute and the associate vice president for graduate studies and academic affairs. She became the vice provost for faculty affairs in 2011. Martin said in an email that her fondest memories will be the times she spent teaching students, and more recently, she enjoyed working with the Society of the Emeriti – a group of officials that maintains connections with former faculty members. “I have loved my time here at GW but am looking forward to retirement, spending time with family and planning my next travel adventure,” Martin said. Interim Provost Forrest Maltzman said Martin’s familiarity with faculty and her knowledge of schools within the University made her an asset in her role as vice provost. Maltzman added that the search for the new vice provost will begin immediately after Commencement, and the committee plans to chose a replacement by mid-summer so Martin can help the candidate transition into the role. Maltzman said in a University release last week he will fill the role internally. In her time at GW, Martin helped create more than 170 new full-time faculty positions as a part of the University’s strategic plan and led a project to create a new faculty expert database. Martin is the seventh top administrator to announce leaving the University this academic year. Charles Garris, the chair of the Faculty Senate’s executive committee, said Martin was a key point of contact between the Faculty Senate and administrators. Shelly Heller, the associate provost for the Mount Vernon campus and a professor of computer science, said she first met Martin when they were both master’s students at the University of Maryland. She said Martin’s impact on faculty life at the University is impressive. Heller added that Martin excels as a faculty member, a well-published author, a sought-after researcher in computer science ethics and a “masterful teacher,” who even now teaches an online course in computer science.